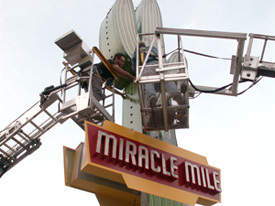 In 2009, the last remaining roundabout that gave the Miracle Mile its name was removed, and the intersection was turned into a T with a traffic light. 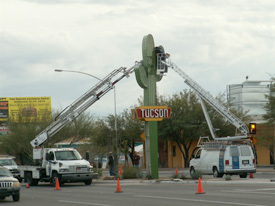 The Tucson Pima Arts Council coordinates the city's public art program, which allocates one percent of public works budgets for public art. 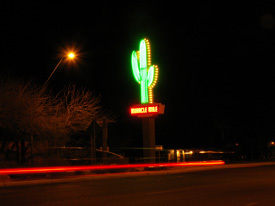 As one of three finalists, I proposed a 30 foot tall saguaro, illuminated in neon, in the median of Oracle Road, just north of Drachman Street. 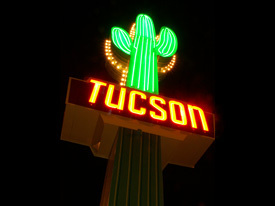 Designed as a two-way gateway, the sculpture pays homage to the historic Miracle Mile on the northbound side and welcomes all to Tucson on the southbound side. Cook and Company Signmakers fabricated and installed the sculpture in early 2010.